Materials Required: AMERICAN THREAD COMPANY “AUNT LYDIA’S” HEAVY RUG YARN, Article 235 3 skeins Gray 1 skein each Dk. 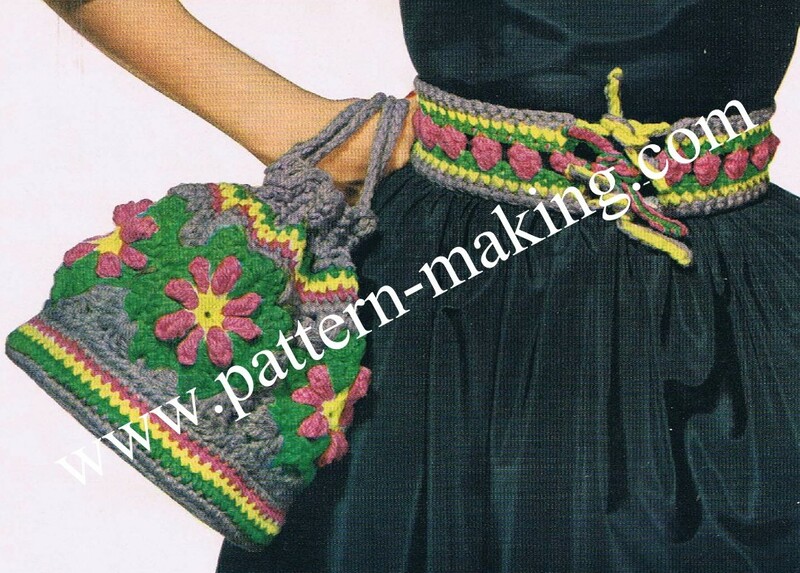 Green, Lt. Yellow and Old Rose Aluminum crochet hook Size G or Size H BAG MOTIF: With Yellow ch 2,: sc in 2nd st from hook,ch 3, sc in same space, repeat from * 6 times, ch3, join in 1st sc, cut yarn. 2nd Round-Attach Rose in joining, ch 3,3 dc in same space, drop loop from hook, insert in 3rd st of ch, pull loop through, ch I to tighten st, ch 2, popcorn st in next sc (popcorn st: 4 dc in same st, drop loop from hook, insert in l st dc, pull loop through, ch I to tighten st), repeat- from * all around, ch 2, join in1st popcorn st, cut yarn. 3rd Round-Attach Green in any ch3 loop of 1st round, ch 3, 2 dc in same space, sc in next popcorn st, 3 dc in next ch 3 loop of Ist round, repeat from * 6 times, sc in next popcorn st, join in 3rd st of ch. 4th Round-SI st in next , ch 3, in same space, ch1 , 2 in same space, skip next , sc in next sc,* skip 1,2 , ch1, 2 in next (shell), skip next , sc in next sc, repeat from * all around, join in 3rd st of ch, cut yarn. 5th Round-Attach Gray in any sc, ch 3,2 in same space, ch 3, 3 in same space, ° sc in ch I of next shell, 3 in next sc, sc in ch 1 of next shell, 3 , ch 3, 3 in next sc, repeat from * twice, sc in ch 1 of next shell, 3 in next sc, sc in ch 1 of next shell, join in 3rd st of ch, cut yarn. Work 4 more motifs in same manner. Sew all motifs together on the wrong side to form a circle. BOTTOM: With Gray, ch 4, join to form a ring, ch 1 and work 8 sc in ring, do not join or turn this or following rounds. Place a marker at the beginning of each round. 2nd Round-2 sc in each sc. 3rd Round 1sc in next sc,2 sc in next sc, repeat from * all around. 4th Round-Working in sc, increase in every 3rd sc. 5th Round–Increase in every 4th sc. 6th Round-Increase in every 5th sc. Continue working in same manner until there are 7 sts between increasing points. Work 1round even. 11th Round-Increase in every 9th st. Work 1 round even, sl st in last st (80 sts, 7-1/2 inches in diameter). 12th Round-1sc in each st working through back loop of sts only, join, cut Gray. 13th Round-Attach Green (when changing color always attach next color in a different place to avoid showing where joined; and work 1 sc in each sc working through both loops of sts, join, cut yarn. Working in same manner as last round, work 1 round Yellow, I round Rose, I round Gray. Sew to motif section. Attach Gray in any st at top of motifs and work 80 sc all around, join, cut yarn. Working in same manner as 13th round, work 1 round Rose, 1 round Yellow, I round Green and i round Gray, do not cut Gray. Next Round-BEADING: Ch 5, skip 1 sc, tr ch in next sc, * ch1, skip I sc, tr ch in next sc, repeat from* all around ending with ch1, join in 4th st of ch. Next Round-sc in same space, * sc over next ch1,sc in next tr c, repeat from* all around ending with sc over next ch 1, join. Next Round-Ch 1 ,* sc in next sc, sc in next sc (s : yarn over hook, insert in st, pull loop through, yarn over and work off all loops at one time), in next sc, in same sc, s in next sc, sc in next sc, repeat from * all around, join, cut yarn. Cut a cardboard circle a little smaller than bottom of bag. Place inside of bag. DRAW STRING: With Gray work a chain about 30 inches, sl st in 2nd st from hook, then sl st in each remaining st, cut yarn. Work another string in same manner. Lace through beading lacing over 2 tr c and under the next 2 tr c. Lace other draw string in same manner starting from opposite side. Sew ends of draw string together. BELT With Gray work a chain desired length, sc in 2nd st from hook, I sc in each remaining st of ch, having a multiple of 3 plus1, cut yarn, turn (this should measure about 1 inch smaller than waistline). 2nd Row-Attach Yellow and work I sc in each sc, cut yarn, turn, 3rd Row-Attach Green and work 1sc in each sc, cut yarn, turn. 4th Row-Attach Old Rose, ch 3, 3 in same space, slip loop off hook, insert in 3rd st of ch, pull loop through, ch 1 to tighten st, * ch 2, skip2 sc, popcorn st in next st, repeat from* across row, cut yarn, turn. 5th Row-Attach Green in1st popcorn st, sc in same space,*2 sc in next loop, sc in next popcorn st, repeat from * across row, cut yarn, turn. 6th Row-Attach Yellow and work I sc in each sc, cut yarn, turn. 7th Row-Attach Gray and work 1 sc in each sc, cut yarn, turn. 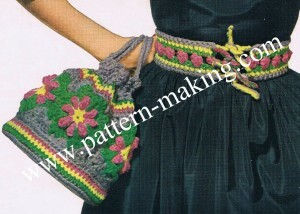 Attach Gray at one corner of belt and work a chain about 4-1/2 inches long, cut yarn. Attach Yellow in same space and work 1 sl st in each st of ch, cut yarn. Work 2nd tie of Rose and Green at center of belt in same manner. Work 3rd tie of Gray and Yellow at other corner in same manner. Work 3 more ties on opposite end of belt in same manner.